WARNING: This post contains mushrooms, mountains, and majestic scenery. This weekend I had the absolute best part of my study abroad experience to date! On Friday 25 of my fellow classmates and I took off for 2 nights in a small town called Cusano Mutri in the region of Campania. Although we were lured by the prospect of mushrooms, hiking, and s’mores, no amount of information could have prepared us for just how amazing of a trip we were in for. 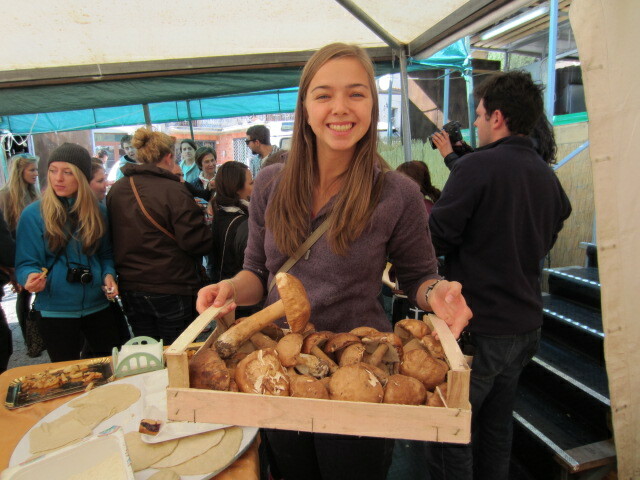 The main attraction of our adventure was Sagra dei Funghi, a traditional mushroom festival that dates back to when rural areas would thank their pagan gods for the year’s harvest. 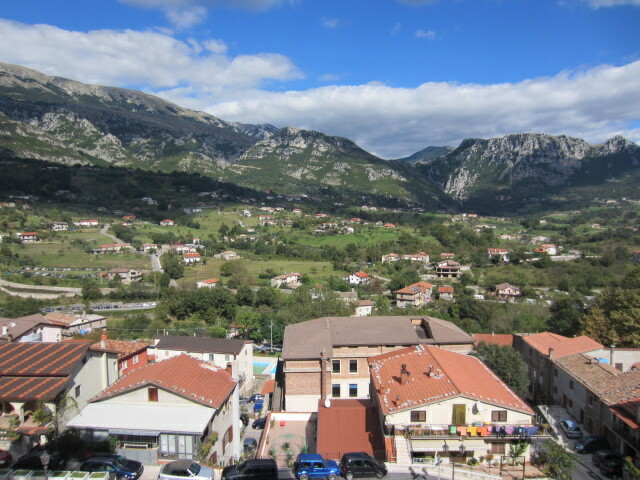 At every meal we were treated to delicious dishes that incorporated the marvelous funghi that thrives in that particular section of the Matese mountains. Everything was so, SO tasty! In addition to the mushrooms we were treated to other local specialties including chestnuts (which reminded me of my home in Michigan since we have a couple trees in our backyard), taralli (a type of cookie/cracker), and local wines. Chestnuts and mushrooms could be found in all sorts of variations since they were in season. I particularly liked a pastry that was filled with chestnut creme and the chestnut (or Castagne in italian) and mushroom flavored taralli. Since we traveled in a smaller group than when we went to the countryside for orientation, we had many more opportunities to speak with native italians that spoke as little english as we spoke italian. Although challenging, such interactions are so valuable and everyone was unbelievably kind to us. In addition to hanging out at the festival we had the opportunity to take to the hills on some hiking trails. “Hill” is a major understatement considering we climbed a steep peak (used for skiing in the winter time) where it is possible to see both the Tyrrhenian and Adriatic Seas! Although we were unable to see either sea due to some clouds, the weather in no way deterred from the already amazing view! After we hiked back down our guides wanted to share another place of beauty with us even though it wasn’t on the schedule. Climbing back onto the bus we followed them as they lead us in their cars to Lake Matese. I’m still not convinced that this place was real and not a computer desktop or calendar. 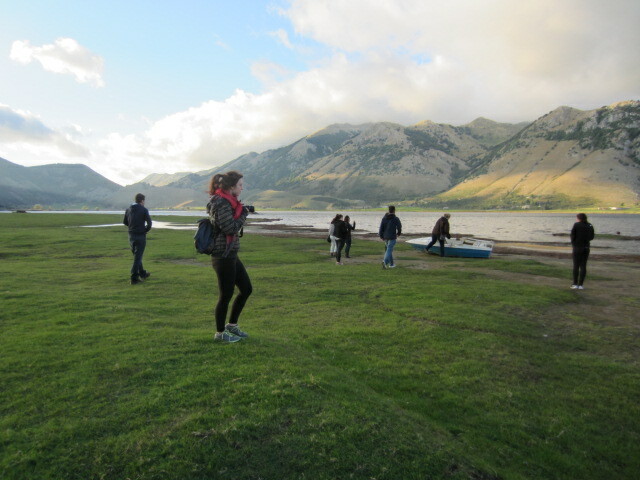 There were (I kid you not) horses grazing completely untethered and unfenced in front of this lake that was cradled by the surrounding mountains, including the highest points of the Mateses. I have never seen such a beautiful landscape as the one I was completely surrounded in all weekend. Breathtaking views were the theme of every moment and every new adventure. I didn’t want to leave Cusano Mutri and I dream of returning one day. There is an olive oil festival in the next town over. Perhaps, (money transportation and convenience allowing) I might be lucky enough to take part in yet another amazing festivity of the mountains! Until I make it back up the winding roads to Cusano Mutri, I’ll be keeping my fingers crossed! Well, hello there!! I’m currently sitting in an adorable little coffee shop in the heart of District 1 of Saigon, sipping some sweet, tropical tea. I think it’s mango-flavored, but I couldn’t be sure. I don’t speak much Vietnamese and most people here don’t speak English, so I’m not quite sure what I ordered–a day spent exploring the city is always a hilarious adventure. I’m usually quite exhausted come bedtime…but each mistake, each misunderstanding, each wonderful moment has me falling more in love with this absolutely insane, stunningly beautiful country. I’ve been here for about a month now; sometimes it feels like I just walked off the plane, and other times it feels like I’ve lived here for years. Regardless, I’ve seen and done so many incredible new things since arriving here. Mostly, I’ve spent my time wandering Saigon–seeing the sites, eating plenty of delicious food, shopping at the local markets, and riding xe oms (hired motorbikes…so much FUN) around the city. We’ve hiked our way through the Reunification Palace, the War Remnants Museum, the HCMC History Museum, Ben Tanh market, and the BiTexco Tower (the tallest building in Vietnam). I’ve found my favorite cheap spa in District 1 for wonderful massages and pedicures. I’ve established some good relationships with local street vendors, who somehow understand through my frantic hand gestures that I’m a vegetarian and no, I don’t want extra pork with my rice. I even found Oreos and Pringles at Co.Op Mart, the Walmart of Saigon. Basically, I’m winning Vietnam so far. Pho // Noodle soup with chicken, beef, or pork. It’s incredibly simple but so, so good. I doctor mine up with hoisin sauce, chilies, and plenty of fresh cilantro, mint, and basil. Banh mi // Vietnamese sandwich on a french baguette (left over from the French occupation of Vietnam!) My favorite so far is a banh mi op la, or a baguette spread thick with siracha, soy sauce, pickled radishes, herbs, and a freshly cooked omelette. YUM. Bun thit nuong // My friend discovered a street vendor that sells this, and it’s sooo good. Chewy white rice noodles, hot sliced spring rolls, freshly grilled pork, crunchy fresh herbs, and plenty of spicy fish sauce. The mixture of hot and cold with a variety of textures is simply delicious. banh xeo // A bright yellow crunchy egg crepe, filled with sautéed bean sprouts. A HUGE plate of fresh lettuce and aromatic herbs is served on the side, and you roll little lettuce tacos with the crepe and dip the whole thing in fish sauce. I could literally eat this every day. ca phe sua da // This stuff will be the death of me. Thick, black pour-over coffee that’s quickly shaken with creamy condensed milk and poured over ice. It’s super sweet, ice cold, and very caffeinated … everything I ever wanted in this world. So, so good. I picked the right place to study abroad!! Most of these delicacies I’ve discovered by hanging out with my lovely host student, miss Hannah (english name). She’s my Open University partner, where we have all of our courses. She has gone above and beyond her basic duties as a host student, and I absolutely love her for it. She has the cutest smile and gives the best hugs; she’s caring and genuine and so much fun to hang out with. We’ve gone shopping a few times (wahoo!!) and we practice Vietnamese a lot too. She’ a really good teacher (her major is English Teaching, so obvi) so I love love love practicing with her. She also takes me everywhere on her motorbike, which is SO much fun (Have I mentioned that I love motorbikes? Hey, I love motorbikes). She spoils me rotten and I couldn’t be luckier to have her. We’ve also taken two little excursions so far–one to the Mekong Delta, and one to Nha Trang, a popular beach town in central Vietnam. Both were breathtakingly gorgeous…a little escape from the hustle and bustle of the city is nice every once in a while. 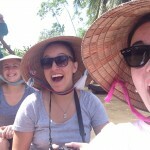 Our trip to the Mekong felt like vacation–a lot of breezy boat rides and napping in hammocks. We spent an afternoon biking through lush, muddy trails, racing each other past lone motorbikes…I felt like I was in a movie!! Nha Trang also felt like a vacation, but in a completely different way. I’m not a big beach person (I don’t tan, I burn), but our trip here was so relaxing and beautiful. We took a fabulous three-island boat tour, complete with snorkeling and a delicious tropical lunch. We also took a cab up to the mountains and got a mud bath–it was bizzare, but I was so weirdly comfortable!! And you know, the absolutely pristine beach wasn’t bad either. I am obsessed with this country and I’m never leaving. Sorry, Mom! That’s about it, so far! We leave for our Cambodia excursion next week, and I couldn’t be more excited!! Stay posted!! 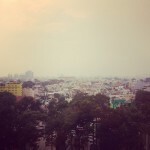 The view from my room at the Bach Khoa Dorm! A #selfie while boating the Mekong Delta! Hey, it’s me again. Surprise surprise this has been yet another busy week. This program definitely knows how to put the study in study abroad. This week alone I have seen 3 shows, had to memorize 2 monologues, read probably 3-4 plays (not really sure), and do little projects/assignments for all of my “electives” (aka voice, movement, etc…) SO I’M GOING CRAZY WITH WORK BASICALLY. As usual we kicked the week off with a bang with a whole day of physical activity. Our movement teacher Sue is this tiny little South African lady (whose accent is just like Ja’mie’s mom, so picture that one). This woman is definitely in better shape than I will ever be, and has the ability to make me sore for 3 days after her class because I am moving with different muscles that I don’t typically use (as this is not a ballet class). It’s hard to describe exactly what movement technique she uses, I think it’s her own creation to be honest. After this we have the lovely period dance class, where we jump and skip around and learn a bunch of peasant dances from the 1600s-1900s. Right after period dance is stage combat, aka sword fighting time. I think it makes sense to have the most dangerous class last in the day when we are all tired. Because being tired and playing with swords go so well together right?? <— jokes. Another full day of 2 acting classes and SPT (aka Hist Lit for all you Loyola theatre majors that are reading this). Tuesdays are very full too as we have 2 acting classes that are 2 hours and I feel so drained by the end of the day! But it’s good to build up my mental stamina! After this day of classes we went to see a new play called The Albion at The Bush Theatre (which oddly reminded me of the House Theatre in Chicago). The script was a little rough as it was the playwright’s first full-length play, but it wasn’t awful. It was set in an English pub called The Albion that is based on a real pub in working class East London. It was trying to deal with a lot of issues: immigration in England, problems that children in the system face with their social workers, and ultimately the very real argument and debate that is alive in England about what the difference between being “English” and “British.” It focused on a political party that feels that their rights and heritage of what it means to be “English” have been lost due to the fact that London is now a globalized city with many cultures represented in it. The show was not a total hot mess, but it needed some work in the script. BUT it really gave me insight as to some contemporary issues in England in 2014. As usual those young classes took up most of my day, but after I finished with class I went to go see Royal Swedish Ballet do Mats Ek’s Juliet and Romeo. I LOVED THIS PRODUCTION. This was one of the best dance shows I have seen in a long time. Mats Ek is able to take his movement style (which is very Mary Wigman/Kurt Joss expressionist) and use it to tell a narrative. I was blown away by the authenticity that was a product of the choreography and spectacular performances of the dancers. In addition, I went on opening night of the run here in London, so I was lucky enough to see most of the original cast that Ek set the ballet on. And to top it all of, Mats Ek himself, in the flesh, like the living breathing human came out on stage at the end of the show. It was shocking and exhilarating to see a living legend on that stage. Ok so usually my Thursdays are really chill, but I had a lot of things to get done, so it turned into yet another very full day! I had my morning Shakespeare class, and we found out that morning that our teacher has been cast in a movie that will be filming out of the country starting tomorrow through the beginning of October. So as a result we are having the schedule all changed around to make sure that we get all of our time that we lost when he returns. Then I got to go to the London Zoo! Anyone that knows me knows about my weird obsession with zoos as I have worked at one for 6 years, so I was super excited that we get passes to the zoo for our time here so that we can go observe animals for our acting work. For the script that we are working on in acting currently, I decided that my character is a meerkat, so I literally sat and watched the meerkats for an extended period of time. I obviously felt right at home in the London Zoo, and I will defiantly be hitting that place up again. After a journey to the zoo I saw probably the strangest show that I have ever seen in my life. We saw a production of Ibsen’s An Enemy of the People at the Barbican Theatre. I did not know that the production was two and a half hours long with no intermission AND IT WAS IN GERMAN. It was fine because there were subtitles, but still it took a minute to catch on as they were speaking lightning fast German. This production had the potential to be one of the best productions that I have ever seen. My attention was on this show like no one’s business and I was sucked in. However once we got to Act IV, things. Got. Rocky. I should first say that the director re-wrote some of the script to put it in a more modern light, and I don’t know how we can really advertise that as Ibsen, but whatever. Dr. Stockmann gives a speech that essentially is calling for a rise of fascism and the audience started clapping?? And then all of a sudden the house lights come up and we have a “round table discussion” with the cast about what is wrong with society. WHATTT????? So obviously a bunch of people that have no clue what they are talking about speak out, and it was just so confusing. Like why do we need to put Ibsen on hold and have a disorganized forum about nothing. It really made me mad. Ibsen is such a good playwright that his text does all of that work for itself, SO WHY MUST WE BE ARROGANT AND DO A THING LIKE THIS??? I like the whole audience participation thing, but I think that this director took it too far. I have actually never walked out at the end of a show being so infuriated. Wow what a time. After that hot mess of a show from the night before, Friday was very low-key. I was so drained from the week that I was just really happy it was the weekend. I got up super early to go to ballet this morning, which was an excellent choice. It was a great class, and I didn’t feel like I was horrible, so go me. 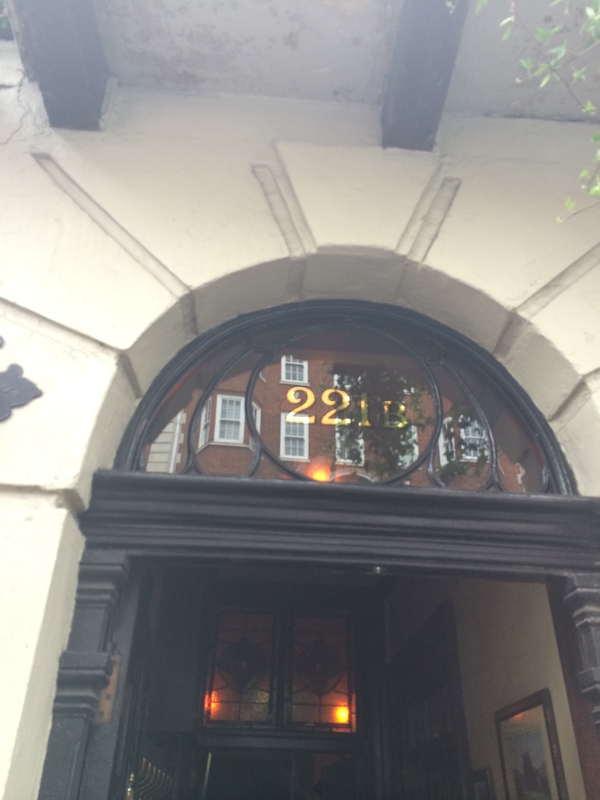 After class, David and I went to the Sherlock Holmes Museum at 221B Baker Street. It was awesome to see the real address! They have turned this house into what a Victorian Home would have looked like at the time. The museum included Sherlock’s Bedroom, Mrs. Hudson’s Room, and Watson’s Room, as well as some terrifying wax figures from some of Sherlock’s most famous cases. Although it was very touristy, we did not care and we were happy to be nerding out. We’ve done the Sunday ritual of going for a run and then going to grocery store already today. Today we decided that we would run by Will and Kate’s house. They live right by us and are surrounded by a bunch of embassies, so it’s a beautiful area. There are a ton of armed guards outside their house, and photography is forbidden… so I can’t snipe a pic for fear of being arrested. But anywho, this should be another busy week full of classes, master classes, 2 theatre visits, and a personal visit to go see the Royal Ballet perform MacMillan’s Manon on Saturday (I’m so excited I can’t stand it). As always thanks for reading! Over and out, y’all! There is a weird trend here for adults, like grown-up people with children, to ride razor scooters through the streets of London. I AM SO PUZZLED I DON’T UNDERSTAND THIS. This is not suburban America in the 2000s, London. Please get it together. We had the privilege of being invited to a reception for the students of the London Centre at a picturesque flat in West London. It was essentially an excuse to dress up and get free food. The owner of the flat casually had three original works by Matisse hanging in his living room, along with a Grecian horse from 8000 BC, an ancient Indian sword, and a few other casual collectables. So needless to say, this was a fun way to kick off a week full of CRAZY work and and assignments. We had a master class with an talent agent today which caused me to get a stress-induced headache as I was forced to think about the future and employment (all terrifying things). This proved to me once again, that this study abroad program and career path is not for the faint of heart, I’m at the beginning of a marathon, not a sprint, and it is always important to keep that perspective. After class today, I went to an urgent care clinic to get my ears looked at because I was afraid that I had an ear infection. I was thinking that I would get slapped with a £50 bill at the end, but I was oddly sent away having paid nothing. Good news is that I didn’t have to pay anything because of socialized medicine in this country and only wasted about an hour of my life waiting. Bad news is that they literally don’t write prescriptions in this country, so if I did ever get an ear infection (as I do frequently) I’m probably sunk. Oh well, we’ll cross that bridge when we get there. We had a short day today as we went to go see The Comedy of Errors at the Globe theatre! This is a reconstructed version of the original Globe theatre that was around in the Elizabethan and Jacobean periods when Shakespeare was writing. It was constructed in this century, and is the only building in London with a thatched roof. Although it’s not the same exact size and it’s in a bit of a different location, it still provides audiences with great theatrical experiences. For the cheap price of 5 quid you can stand for 2 hours as a groundling and watch a show as a peasant would have done. It’s kind of fun because you get to lean on the stage. If you feel so inclined though, you can pay for a seat. It is an outside theatre and it rained that day, but David and I were literally the ONLY 2 PEOPLE in the theatre to not get wet because were positioned so close to the stage that we were protected by the over-hang #blessed. Seeing a show here was a great experience, and I’m sad that I probably won’t be able to go there again while I’m here, as the season is almost over. After the show, David, Declan, Katelyn, and I went to get a pint at Ye Olde Cheshire Cheese, one of London’s oldest pubs. It was built in 1538 and then rebuilt after the fire of London in 1666 where it has been since. This was followed by a night of watching Netlfix because we were all too sick to be out in public. David and I got up to go to French’s, a huge store full of literally every play ever written to find plays for our audition class. I had to travel all the way to London to be told by my audition teacher that I need to get familiar with more American playwrights. So after getting our new plays, David and I went to go see a play adaptation of Jeeves and Wooster, two stereotypically English characters (a bumbling rich man and his clever servant) that have appeared in short stories and television throughout the past 60 years or so. We got a special deal on tickets, they were only £10 because the show was closing that day. Thank God it was because to be honest it was not great. We were however asked not once BUT TWICE for directions, so clearly we have started blending in and look more comfortable in our surroundings. After being a couple of old geezers at a Saturday matinee, we continued this trend back to the flats where we watched Mulan with our friends, because again, everyone is sick. We went on a brief run today that was interrupted many times by me huffing and puffing as I am almost done being sick, but not quite. We have SHEDLOADS of work as the Brits say, so we have locked ourselves up in a coffee shop where we are obviously being distracted by blogging and Facebook. This is a busy week as we are going to see a show on Tuesday, Wednesday, and Thursday. I am very excited to be going to see Mats Ek’s version of Juliet and Romeo at the historic Sadler’s Wells theatre on Wednesday. It should be a fun/busy/productive/memorable week. Until next weekend, over and out, y’all. So on Thursday we actually got #blessed with having the afternoon off. I finished class at noon that day, so I decided to hop on a bus and go take a ballet class. It was one of the strangest experiences in my life. First of all, the class itself was good, and it was nice to be in a familiar environment (aka a dance studio) while being away from home. Despite the comforts I felt at first, I was pretty much a hot mess in the class, as it has been almost 5 weeks since I have taken class. Here’s the weird part about class, and if you aren’t a dancer/don’t really care about dance, I suggest you keep skip this. So the class was “taught” by a very old man who could hardly walk. He had a stick and sat at the front of the room while his assistant taught the class. The man would not give corrections to students individually and would tell his assistant what the corrections were. Additionally, here you pay the teacher directly in cash for the class AND pay a fee to the dance center. I guess that’s just how they roll over here? Idk. Today I went with my friends Vanessa and Julia from the theatre program to go visit Buckingham Palace. We got the chance to actually go inside the palace because the royal family are now in Scotland on holiday. When the Queen is at home, the palace is not open for tours, so we wanted to take advantage of this chance. We got to see 19 of the 700 rooms in the palace, so Liz really gave us the grand tour. Unfortunately there is no photography allowed inside the palace, so I can’t give you a first hand account of what went down. I can say that the interior of the palace is absolutely breath taking, and looks like something out of a story book, because it basically is. 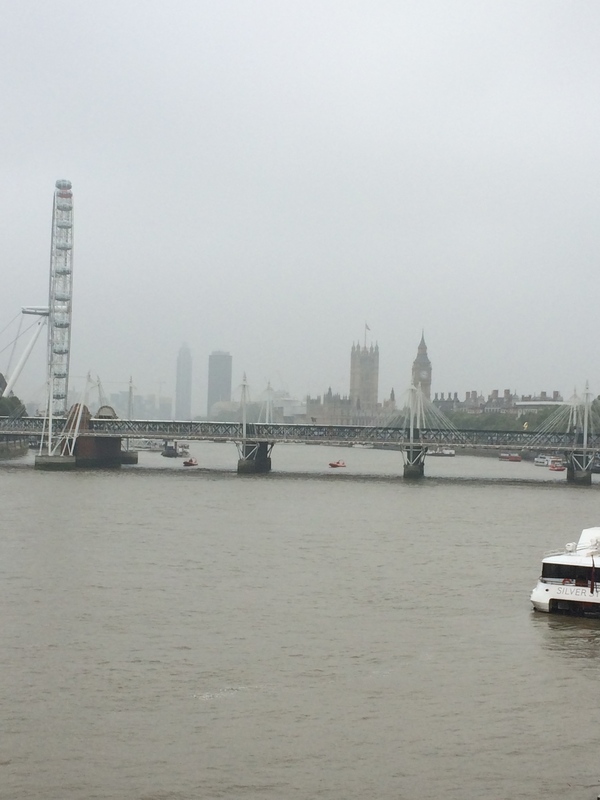 After seeing the palace, we decided to walk to Parliament and Big Ben to take a gander at those sights. To our luck, the street in front of Big Ben was closed for a bike race, so we got prime picture taking time. The week has absolutely flown by, and instead of giving you a minute to minute update of what went down this week, I’ll stick to the highlights. Today was the first day of acting classes, which proved to be very exciting and incredibly stressful. I can already tell that my professors this term are no-nonsense people that have very high expectations. Even though they all have very high expectations, they are all still very nurturing people, and I can tell that they have a lot of great things to teach us. Tuesday Night we went to go see The 39 Steps. This play has been running on the West End for a few years, and is based on a novel and Hitchcock film of the same name. It is a hilarious melodramatic farce where all of the characters in the story are played by the same 4 actors. It was a very fun show with a very talented cast. YOU DO NOT GET A PROGRAM FOR FREE. Anyone who knows me knows that I am hoarder of show programs, so obviously I was a little annoyed when they said that the programs cost £3.50, and I am a broke student. After 2 long days of classes, I felt like I was in the middle of week 7 not week 1 today. I am so out of shape that it isn’t even funny. It has been a while since I have been in class for this many consecutive hours, but you gotta do what you gotta do. After my legs were sore from walking all morning on Thursday, it was time to take another walk! 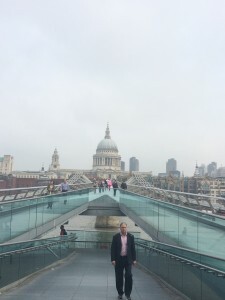 We took a walk from the reconstructed Globe which is just south of the Thames, across the Millennium Bridge, and then all the way to the West End theatre district. 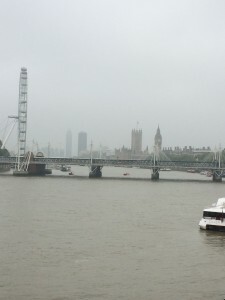 The purpose of the walking tour was to see how the theatre scene moved from central London, to being across the river, and to eventually being concentrated in what is now known as West London. The Globe was reconstructed in the late 1990s after archaeological digs at the sites of the original Rose and Globe theaters occurred. The reconstruction aimed to be as close to the original as possible (without violating fire codes). We did not go inside the Globe today, but we are seeing a production there in 2 weeks time, so stay tuned for updates on that. 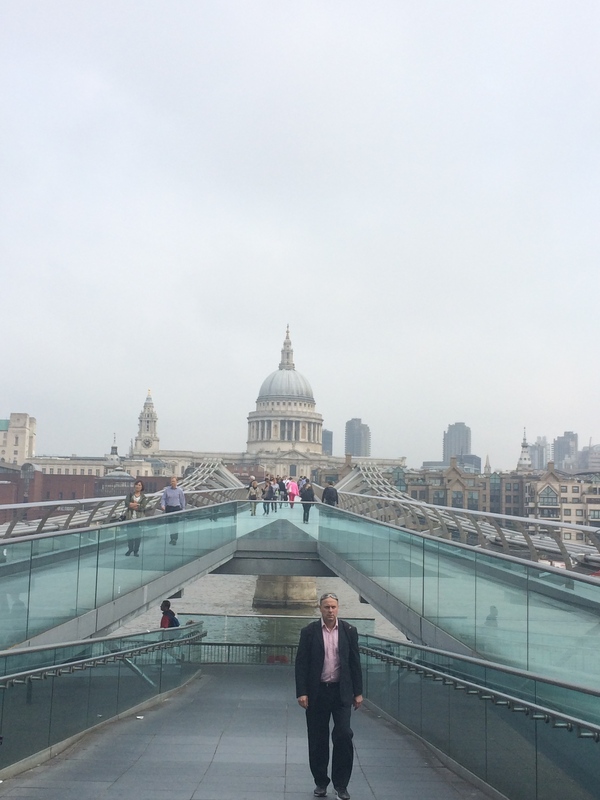 After we were here we crossed the river to be greeted by St. Paul’s Cathedral and walked over to historic Fleet Street, where the famed barber Sweeney Todd had his barber shop. Although we didn’t find any pie shops, I did find a barber shop there. While here we walked and saw the Royal Courts of Justice and Prince Henry’s room (one of the few buildings to survive the fire of London in 1666). We also saw the Middle Temple and Temple Church which were both build by the Knights Templar. The walk then concluded as we reached the outer edges of the West End theatre district. We saw the Theatre Royal Drury Lane which has been in existence since 1663. Now many of Broadway-style play houses exist here where one can find productions that are essentially the same as Broadway productions. We went on a little adventure through London today! We decided that we were going to get tickets to see The Curious Incident of the Dog in the Night-time, so we hopped on The Tube, and visited the TKTS stand in Leicester Square to get our tickets. The show was amazing! It was a great piece of contemporary theatre that had a great blend of spectacle and story. If you ever get the chance to see this show, I highly recommend seeing it. It was so great that I even paid £4 to buy a program. After this we went on an adventure to find leather gloves for our stage combat class for working with swords, and we got very lost in a very posh neighborhood, but we eventually found our way. We were not lost enough to find our way to happy hour at the local pub though. 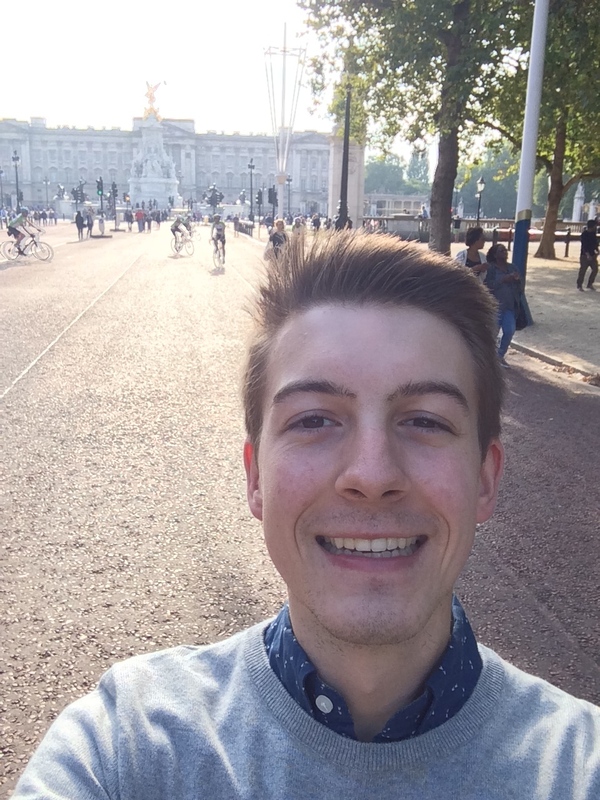 This morning, David and I went on a run (more like walk-jog) through Kensington Gardens and Hyde Park. We have some homework to attend to as we prepare for another grueling week of classes. I hope you have enjoyed this weekend update. Over and out, y’all. In France there is never an absence of things to do (or, as the slang goes, des trucs à faire). I am in my fourth week here and I absolutely adore the culture. I love getting to know the city of Nantes during my long walks and meeting new people at the university and around my host family’s home. There is also a lot going on in such a small city. Nantes is located in the Pays-du-Loire region just south of Brittany, in the northwest of France. Paris is located near to the center of the country. As the 6th largest city in France, Nantes has prestige as a city of many sides. It has 2 rivers flowing through its picturesque downtown. The Loire River flows through the southern part of the city from east to west, and the Erdre River flows from north to south towards the western part of the city, near the University of Nantes. The host mother Marine gave me a pamphlet on ideas on what to do in Nantes. The family regularly goes on weekend vacations, so I will be alone this weekend to explore the locale and do some new activities. Wish me luck! I will keep you in the loop about what I choose to do. I thought it would be nice to show how I am spending my time here, week upon week! This schedule is flexible and subject to change at any time. Please feel free to contact the tutor, Rachel Markle, for more information. Yes, I do actually study here! After posting all of my photos on Facebook, to share with family and friends, the number one question I received was “Joanna, are you actually in school or was this a hoax for a long vacation?” For everyone that is very much worried about this, yes, I do actually study here! So let me explain how classes work here. We have to be enrolled in 12-18 credit hours to be a full time student through USAC, the program here in Costa Rica. Classes run everyday aside from the weekend. We have class on Fridays, but only in the mornings. Every class runs for 3 hours! You read that correctly, 3 hours! Because of the long hours, each class usually meets only once a week. The Spanish track classes, however, meet more than once. The track classes are the average Spanish class you would take at Loyola. On top of my track 4 classes (6 credits) I have also elected Latin American short story and essay, Latin American cultures and Latin American literature (each 3 credits). With most of my classes meeting only once a week, I had every Thursdays completely free, but decided I would like to do something instead. A lot of the professors from these classes find fun ways to teach us about the language and culture. We have had field trips, went to coffee shops for class, and even incorporated soccer into our lesson plans! A great experience that USAC offers, that I have decided to take part in, is volunteering at local schools to help teach English. I have been helping a teacher in a nearby school with 1st and 3rd graders. These kids are amazing and it is very rewarding nonetheless. I am learning from them as much as they learn from me, not only Spanish but also the culture! 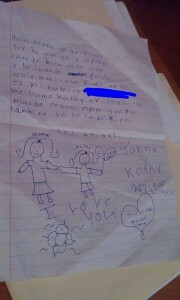 One of the little girls in 3rd grade wrote me the cutest letter after just 3 Thursdays of volunteering. I recommend taking part in things like this no matter where you study abroad! When it comes to my classwork and homework, I would definitely say it is all challenging, but not impossible! My professors are all very supportive and willing to help. The literature professor encourages us to call her at home if we need any help with homework or have any questions about our reading for class. The track 4 Spanish class professor gives us exams in partners, where we have to reason with each other (in Spanish of course!) to find the correct answer and explain it. A lot of the homework involves reading, and a lot of it! A lot of the classes are based on participation, which needs to be in Spanish. The professors here want you to make mistakes so that they can help you correct them. As a piece of advice, prepare yourself for a lot of this and don’t take it personally. The professors are all there to help, not to criticize because they all know how hard it is to learn another language. All of my professors speak at least one other language and can easily relate to us as students. And of course, if anything ever causes us problems in our studies, we have a great team of USAC people to help us resolve them. Like mentioned before though, when studying abroad, you need to be open to learning from more than just the regular classroom. I can honestly say that I learn more outside of the regular sit at your desk, look at the board and listen to the professor, setting. I learn at home, from the host family, from ordering at a restaurant, from taking a cab, a bus, listening to music, and even from just reading every sign I encounter. Keep your eyes and ears open! That’s the full experience of study abroad, your learn from EVERYTHING. An average day in class. 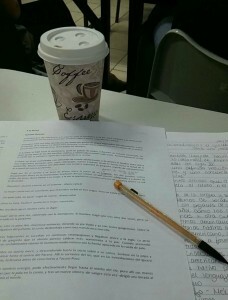 Notes and coffee! Encouraging self SnapChats for those 4 page essays! 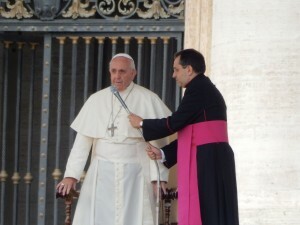 Pope Francis converses with another Church leader right before the Audience begins. 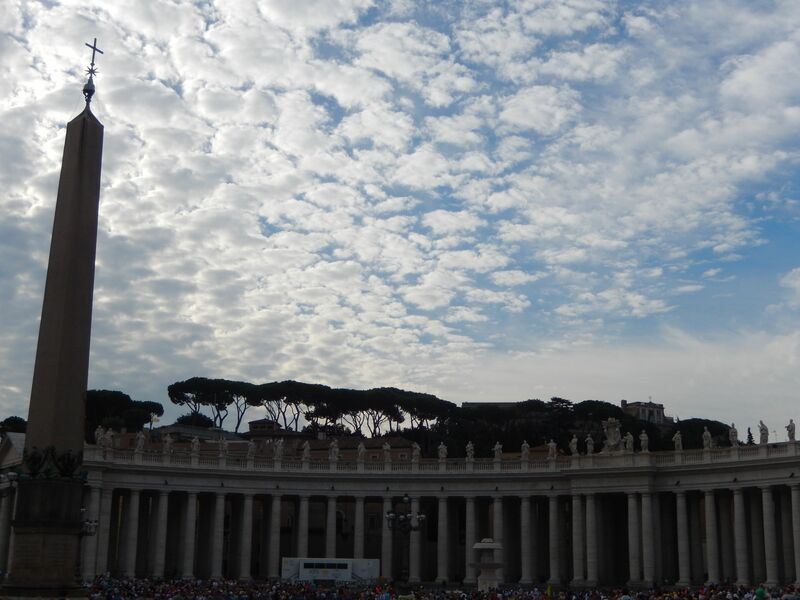 So this past Wednesday I had the wonderful privilege and pleasure to attend my first Papal Audience in the Vatican; in fact, the professors at JFRC (the Rome Center) cancelled classes all day so that every single student would have the opportunity to go to this impressive event. I began the day by waking up before 6am so that I could get into the event. Although the projected start time was not until 10:30am, we were told to be there at around 7am so that we could guarantee ourselves the best seats. 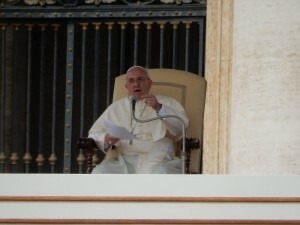 As for myself, I completely lucked out, as I was able to get a seat just a few rows from where the Pope was speaking. Taken a few hours before the start of the Papal Audience. The Vatican right before the Audience begins. During the audience, it was an amazing experience for me. 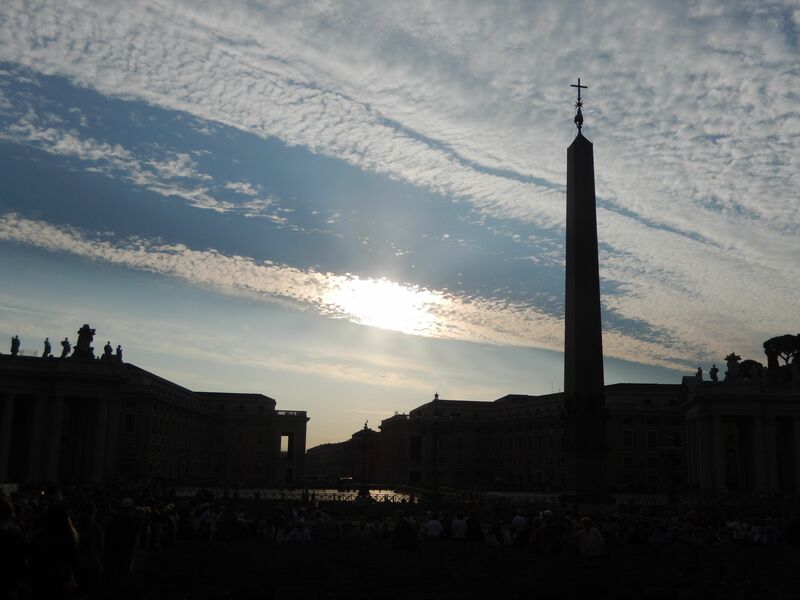 Although I do not consider myself religious, there was a spiritual aura with just being able to sit back, listen to what the Pope had to say, and to literally feel the history of the Vatican all at once. During this time, I really gained a sense of my purpose, not only with what my mission on this earth is, but also who I am and what I have to offer. Because the Pope offered his blessing and reaffirmed a sense of faith, I was able to reaffirm a sense of my mission here. Pope Francis delivers his address to everyone watching in the Vatican. Anyway, I felt that it was very important to give this unique experience its own entry. If anyone reading this has the chance to go to Rome and experience a Papal Audience, do it! You will not be disappointed, as it is an event of growth and self-discovery. I will be posting again soon on my trip last weekend to Bari, a small coastal city on the Eastern shores of Italy.